Slightly Played condition cards can have slight border or corner wear, or possibly minor scratches. No major defects are present. Slightly Played condition foils may have slight fading or indications of wear on the card face. Slightly Played is set at 95% of NM price. Moderately Played condition cards have moderate wear, or flaws apparent to the naked eye. Moderately Played condition cards can show moderate border wear, mild corner wear, small water damage, scratches , creases or fading, light dirt buildup, or any combination of these defects. Moderately Played is set at 85% of NM price. 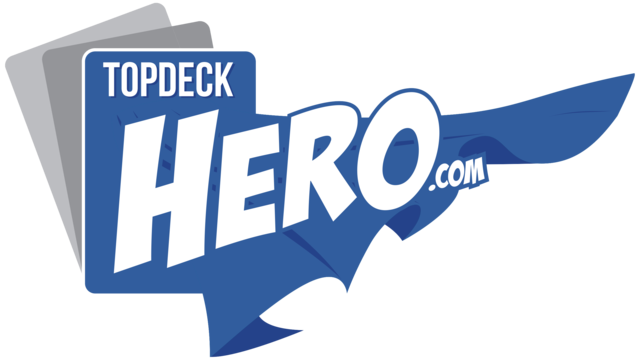 Hero Deals condition is a Topdeck Hero particularity. Grading cards is very costly and time consuming. Therefore, in order to be able to bring you our inventory online in faster delays, we came up with Hero Deals : we save on costs, you save on prices! Everycard in Hero Deals has been quickly inspected to remove all bellow Fair Condition. Therefore, it should consist roughly of 50% Near Mint, 40% Slightly Played and 10% of good looking Mildly Played. Hero Deals are set at 90% of NM price. Are you in for the gamble? 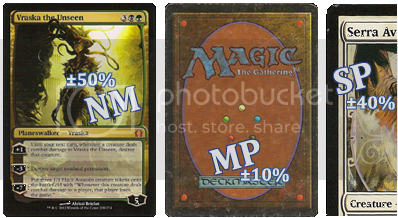 Damaged condition cards show obvious tears, bends, or creases that could make the card illegal for tournament play, even when sleeved. Damaged condition cards have massive border wear, possible writing or major inking (ex. white-bordered cards with black-markered front borders), massive corner wear, prevalent scratching, folds, creases or tears. There are no Damaged cards on this site.